I have not started to grade the exam papers sitting in my study but I found the time to patrol blogs and enter an event. (lol) This is my entry to the Monthly Blog Patrol hosted by the lovely Coffee, of The Spice Cafe. My entry is inspired by the very talented Gattina of Kitchen Unplugged. 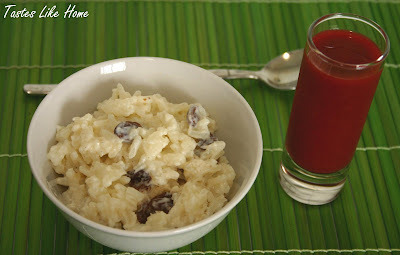 She recently made a creamy rice pudding with strawberry sauce that had me obsessed and yearning for rice pudding. 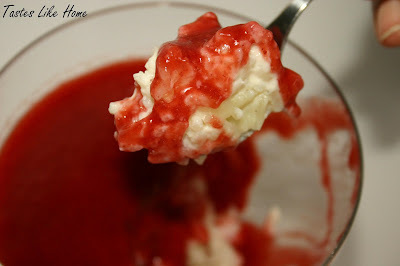 Besides I was itching to try it with the strawberry sauce. Here is Gattina's recipe. The recipe is in two parts, for the rice pudding and the other for the strawberry sauce. 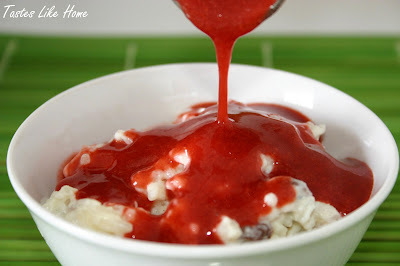 I created my own recipe for the rice pudding but used her recipe and method for the strawberry sauce though I used frozen strawberries. In a heavy-bottomed pot combine milk, rice, cinnamon stick & vanilla bean seeds and bring to boil. 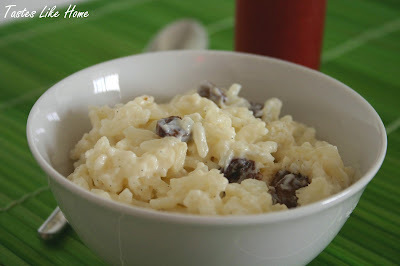 You can serve it buffet style - rice pudding in a large dish and sauce in a jug for easy pouring/drizzling or the sauce can be put in individual shot glasses.